If you’re still following @PitchersHit8th on Twitter, this post will come as no surprise to you, and is actually long overdue. If you loyal four readers are REALLY loyal and only come here, well, then I apologize for the lack of updates on this site and for not clueing you in sooner! Yes, I’ve quoted a Sugar Ray song above, and no, it won’t be the last time in this post. Again, my apologies. However, as I was thinking of what to write here, this song kept coming back to me as apropos of what’s happening (has happened) and a general descriptor for what it means to me as the end of one thing but – I think – the great beginning of another. From the first post here ( Soriano = Zito? – circa May 2008 ) to the last ( Josh’s two-part lead-up to the 2013 draft – circa May 2013 ), this website has been a labor of love – admittedly sometimes more labor than love – but one born out of my desire to continue to be a fan of the ball club I grew up with, despite the many miles between us. It’s that part where it became more labor than love that helped lead to the next chapter. Pitchers Hit Eighth has moved to Cards Conclave. Cards Conclave is a collaboration of many great Cardinal blogs, including this one, that will allow all of us to focus on great writing rather than just making sure we have something new on the website every day. Rather than trying to keep current, we can each focus on what we do best individually while providing great content across a wide array of topics at the main site. Confused yet? Basically what this means is that Pitchers Hit Eighth will retain its own identity at the Conclave, and if all you want to read is stuff from Josh and I, you can very easily do so. But if you want to get all of the Cards coverage you can handle from a bunch of great writers, you can go to the main Cards Conclave site and read new posts every single day of the week. It’s really a win, win, win. Between the first Sugar Ray line and this one, it’s easy for me to translate what this move is really all about for me (and by extension, Josh as well) – falling in love again. Getting back to enjoying watching Cardinal games instead of looking for angles for the next day’s post. So when this website as it was constituted is, for all intents and purposes, over – we’re falling in love with a great ball club all over again, and with writing about them. I know I don’t speak just for us, but for many of the other writers at the Conclave as well. Can I still come over? Of course! As previously mentioned, you can still visit Pitchers Hit Eighth every day at the Cards Conclave! And, since I know how much you love reading PH8 from 2009, this site will never cease to exist in its current format. We’ll keep it up for referencing when something said many seasons ago requires shaming, etc and so on. So you can still come visit PH8 here too! We’re not done, we’re just getting started! Come visit Pitchers Hit Eighth at Cards Conclave. Thanks, as always, for reading. The excitement of Draft Day feels similar to the start of Hot Stove action with the main difference being June almost always brings promise. December typically offers highs and lows depending on the season, but only an occasional head-scratching move in the first round can dampen the mood of adding new hope to the ranks. With the Cardinals about to add to the game’s best farm system, the top two picks are in focus today with an eye on possibly finding the next Wacha already in the organization. All of the following views come from an arm-chair scout as I have not had the good fortune of seeing any of the top arms in action. And while I do think it is possible for St. Louis to end up drafting a position player (shortstop anyone), my money is squarely on at least one of the seven names below wearing the Birds on the Bat. Due to the joys of technology, there is almost no such thing as a surprise prospect. The Cape Cod League still ranks high on the Cards’ list as are a number of high school showcases. No matter which direction the club decides to take, one certainty will play out Thursday when a couple of names get the call every young boy dreams of from the time they can swing a bat. Potential beats out playing time as St. Louis proved last year, and the opportunity to find yet another top of the rotation arm grow as other teams look to make the splashy pick. The Cardinals’ brain trust will stick to their plan but only 18 picks stand in the way of knowing just how good the summer can be for State College or Johnson City. Of course, the rest of the picks are important too, and the dramatic first pick can be debated only so long until #28 gets announced. Much like with last year’s haul, the new rules put planning at a premium so expect the unexpected. Reports continue to swirl about who may fall due to a variety of reasons so feel free to add to this list in the comments or tell me I’m nuts! Prospects are not created equal and now just seems like the perfect time to dig into the high school ranks. Before looking at the Fab Five high school hurlers, however, two college southpaws have also put themselves into the discussion. Once considered a top pick, Indiana State’s Sean Manaea has not been able to maintain the same level displayed last summer on the Cape. He is a Scott Boras client as well and could prove an expensive investment, making for an interesting option at either pick. On the other hand, polished Gonzaga junior Marco Gonzales consistently has been tied to St. Louis in mock drafts and could be plugged into a full-season role quickly. While both LHP present ‘safer’ picks given their pedigree, many moving parts have to fall into place for one or the other to be on the board. If the Cards are thinking about going the left-handed route, there is a pair of talented high school athletes who project to help from either the mound or the batter’s box. Trey Ball is the more heralded of the two but also positioned to go anywhere from the top ten to maybe the end of the first round. He stands at least 6-5 and projects as a strong option to stay in the rotation or transition to the outfield. The Gatorade Indiana Player of the Year has committed to the University of Texas and won’t come cheap, something that could allow him to drop within range of #19. Perhaps the wildcard in the race for the 28th pick, St. Louis prep star Jake Brentz took the unconventional method towards the draft. He didn’t play his senior year, opting to strengthen his resume in Iowa with a wood-bat league. The two-way player signed with Missouri but mainly for his bat given the short amount of time on the mound. Brentz could also appeal to a number of teams looking to utilize the power arm from the left side. While other lefties are sure to be drafted in the first round, a trio of high school arms has caught my attention for very different reasons. The first, Devin Williams, has two things in common with Brentz as he is a fellow University of Missouri recruit who hails from the Cards’ backyard. Williams also ranks in the top 50 of Baseball America’s Prospects with a good chance of being snatched up before the 2nd round. There are long shots and then there are hail mary passes that typically wind up on the ground. My final pair belong in this category, strictly from the lack of buzz that normally surround St. Louis draft picks. Every once in a while a couple players come around that just seem to have ‘it’ even though the fit may not make sense. Hunter Harvey screams that to me, right down to the fact that his father was a big league closer. I appreciate that they have had a plan from the start and let teams know that turning pro was the No.1 option. Of course that could backfire, and the Cardinals rarely gamble when drafts are concerned. As the saying goes, there is an exception to every rule, and Kohl Stewart certainly fits that bill. It appears Texas A&M has locked up another star, this one of the two-sport variety. Stewart would be the gamble worth taking in my opinion, since he would surely get top billing in the readjusted Top 1o list. With as many as four more graduating off to play under the Arch, Stewart may be the one player who could bump into the top 3 from what many consider a down year. It should be a pipe dream that the future quarterback even makes it out of the first five picks, but I can always dream of having a third Texan flamethrower drafted with the 19th pick, right? Well, if the loyal three have made it this far, it is time for the reward. Tomorrow brings much excitement for the PH8 family, and it will be way better than seeing St. Louis catching royalty past and present tossed by a punk. With the final draft preview before Thursday’s big day, I get to look at my favorite part and that is only a sliver of the fun. Puzzles were never much fun for me, but I always did enjoy building teams. The above links for State College and Johnson City already have some of the holes filled in, so I get to do the rest. The one gap I look forward to the most, though, has nothing to do with the draft. Former 2nd round pick Jordan Swagerty recently hit the mound again in Florida, as his recovery from Tommy John surgery provides yet another story line to follow this summer. He already has experience at Springfield and could provide a nice spark in a variety of ways for a few different Cardinal rosters. Check out his progress here and then get ready for the new PH8 experience! As much as I enjoy the lead-up to the MLB Rule 4 Draft, the honest truth is way too much misinformation comes out in the week before Ryan Franklin represents the Cardinals. It appears picking 19th serves St. Louis well in the first round, however, with the 2013 edition looking to score the third potential ace in the last five years. While I don’t personally make mock drafts, enough of the names have circulated now to get a good feel for who could be the next Shelby Miller or Michael Wacha. Thursday was a wealth of emotion, mixing huge highs with Franklin-like lows in closing out the longest game in memory since a certain 20-inning live blog that shall go unmentioned ever again. But in honor of our three loyal readers, my draft preview will stretch across the weekend right into next week where more big news (white smoke?) leads up to Thursday’s next bite at the prospect apple. Two more first round picks will join the hallowed ranks of the Birds on the Bat, and recent history shows a good chance of making it to the all-important Texas League sooner rather than later. Since I live just down the I-44 from Springfield, all of my minor league games dating back to 2007 have been spent watching the defending TL Champs turn many unknowns into household names for the Cardinals. Not only is Hammons Field a great place to take in a game, there is not a bad seat anywhere, and I highly recommend the Redbird Roost. As nice as the stadium is, by far my favorite part of taking in an SCards game is the competition. Springfield is one of only four teams in the North Division and plays the other three squads eight times. Double-A can make or break your career, and St. Louis has taken to aggressively promoting its top talent in order to test them. Look no further than the first two months for the Cardinals and where each of the reinforcements pitched at least part of 2012. Aside from Miller who spent the season in Memphis, eight hurlers who wore an SCards uniform at some point last year have been called up to the Majors. Wacha earned a late season promotion and was a member of the Championship squad. Joining him in raising the first title for Springfield were Carlos Martinez and Seth Maness in the rotation. They replaced John Gast and Tyler Lyons who earned mid-season promotions to Memphis as well as Trevor Rosenthal, who brought his 100 mph fastball to the big league bullpen. You can’t win without a strong bullpen, and recent call-ups Michael Blazek and Keith Butler have provided as strong a duo as the Texas League has seen the last two campaigns. Any way you look at it, Springfield’s model has proven successful but can not last without continued support. All of the injuries have a trickle-down effect, putting stress on each level. Palm Beach and Peoria have stepped up with last year’s draft picks filling in admirably, but the true test will come in the next two months. The Cardinals have a real shot at adding another late season burst as Wacha did down the stretch. The question will be which direction the organization takes especially if another big-armed college hurler drops in their lap. Check back for part two on Sunday, where the list of potential rotation mates gets introduced, PH8 style. 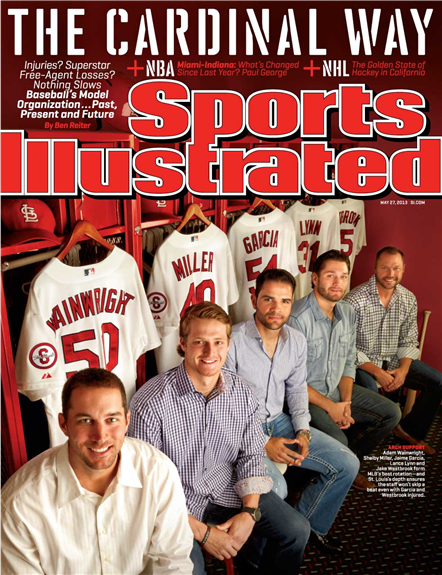 The Cardinals’ starting pitching rotation is on this week’s cover of Sports Illustrated. Well, what WAS the Cardinals’ starting pitching rotation. Two-fifths of that photo are now on the disabled list. One for the season (Jaime Garcia) and one indefinitely or until the medical staff runs out of elbow injections (Jake Westbrook). As the Redbirds prepare to begin another road series, this one their first trip to Wrigley Field in 2013, they bring with them a 2013 MLB best seven-game road winning streak. By virtue of a three-game sweep in the nation’s capital and four games worth in Milwaukee, the Cards head into Chicago with an opportunity to set themselves apart with the longest road winning streak in the league this season, a distinction currently shared with the Atlanta Braves. While the Cards obviously hold the longest current streak, you’ll note that the Detroit Tigers are lurking right behind, albeit having taken four off of the Houston Astros. Yes, albeit. As in, hapless. Not to be confused with J.A. Happ-less.